On Long Island, some of the damage done by Superstorm Sandy wound up being an environmental boon. Years later, residents are wondering how to prevent things going back to the way they were. In the aftermath of 2012’s Superstorm Sandy, Mike Bilecki, a natural resource manager for the US National Park Service, went down to the marina in Bellport, New York, to get a sense of the damage. It didn’t seem like much, honestly—Bellport had been largely spared. But just when Bilecki turned to leave, he spotted something on the horizon. “It looked like there was a part of the island missing,” Bilecki says. Four kilometers from where he stood, out across Bellport Bay, Sandy had blasted a swath through Fire Island. Six years ago today, Sandy made landfall on the east coast, causing more than US $60-billion in damage and cutting power to eight million homes from North Carolina to the Canadian border. Come January 2013, thousands of residents in New York State still lacked heat. And in Bellport, a small town on the south shore of Long Island, about 80 kilometers east of Manhattan, Sandy had punched a hole through the only thing separating it from the open Atlantic Ocean. Barrier islands like Fire Island are more like overgrown sandbars than proper islands; they are narrow, sandy stretches that run parallel to the shore. They create bays between them and the mainland, and buffer inland areas from the full strength of the sea. Like dunes in the desert, barrier islands are ephemeral: they grow as sand accumulates and die as it washes away. This gradual process is accelerated when intense storms like Sandy, with storm surges meters high, wash over the island and pierce through to the bay. Sandy made three breaches in Fire Island, two of which were immediately filled by the US Army Corps of Engineers. The third, near Bellport, remained open. That breach was in a federal wilderness area, and laws prohibit it from being closed unless there is a need to save lives or avert extreme damage to property. Communities on Long Island’s wider Great South Bay were not happy with the red tape. Many believed that the breach was responsible for flooding events after Sandy, which had hit low-lying houses near the water’s edge. Community meetings demanding the breach’s closure were held as frayed tempers flared. Carl Lobue, a marine scientist at the Nature Conservancy, attended one of these meetings. Everyone there had a terrible experience with the storm, he says. Lobue was no exception—his parents had lost their house to Sandy. “People were so angry that they hadn’t closed the breach.” But Lobue, with his scientific background and familiarity with other breaches, was able to reassure those who’d gathered that this breach probably wasn’t a threat. Further scientific research later confirmed Lobue’s message. 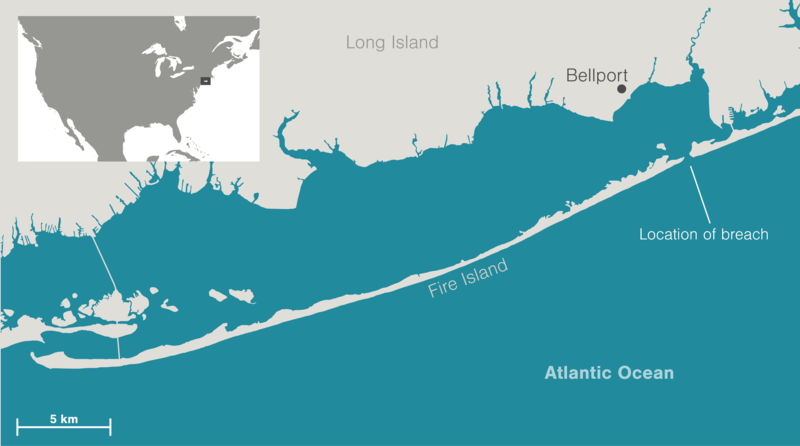 A team led by Charles Flagg, an oceanographer at nearby Stony Brook University in New York, found that the breach had not increased water levels in Bellport Bay and was therefore not responsible for the flooding. The winter after the storm, it wasn’t just public opinion changing—Bellport Bay itself underwent a transformation. For decades, pollution and overfishing had ravaged its marine life. Nitrogen runoff from septic systems and agricultural fertilizer had caused intense algal blooms. The water had been brackish, the bottom barely visible through the murk even in shallow spots. But now, the water looked clear. Within a year, new life, including eelgrass, seals, and fish such as fluke, striped bass, and bluefish started showing up. Claudia Hinrichs, a graduate student in oceanography at Stony Brook University, investigated the transformation. Using computer modeling, she found that the breach had reduced the amount of time it took for water to cycle out of Bellport Bay from 19 days to five. This quick overturn was allowing the bay to clean itself up for the first time in decades. As the community saw firsthand the effects the breach was having, that initial anger turned to support. Petitions and tense town hall meetings were replaced with focus groups and discussions on how to further restore the bay and prevent future pollution. “The breach showed what might happen if you could clean things up,” says Flagg. The breach won’t be open forever—as nature takes its course, it will fill in with sand. When that happens, the bay will likely return to its former state, Flagg says. But changes are in the works to curb pollution. There are nascent plans to update and revise Long Island’s wastewater system. Legislation signed in 2017 banned the construction of new cesspools and requires the tracking of septic failures. And in March 2018, work began on replacing an outdated pipe that carries treated wastewater under the bay to the Atlantic to prevent dangerous leaks. Dan Garisto is a freelance science writer whose work has appeared in publications such as Science News, Symmetry, Eos, and Nautilus. He writes about physics and whatever else catches his eye. 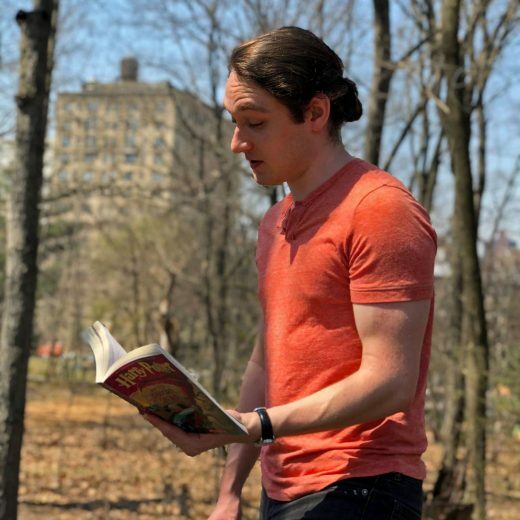 Dan is also an avid reader of obscure historical texts, a fact that is not demonstrated by this photo. Cite this Article: Dan Garisto “The Unexpected Upsides of the Hole in Fire Island,” Hakai Magazine, Oct 29, 2018, accessed April 23rd, 2019, https://www.hakaimagazine.com/news/the-unexpected-upsides-of-the-hole-in-fire-island/. Three years after Superstorm Sandy slammed into New Jersey’s coast, few local communities want to accept that the Shore’s glory days are numbered.